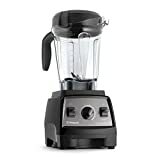 Vitamix 5300 Blender Review - Is It Worth the Price in 2019? 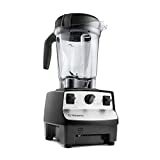 Home » Kitchen Gear » Best Smoothie Blenders 2019 (From a Real User) » Vitamix 5300 Blender Review – Is It Worth the Price in 2019? Welcome to this Vitamix 5300 Blender Review. My goal is to use my 5+ years of experience owning a Vitamix to give you my unbiased assessment on whether you should get it or not. Whether or not the Vitamix 5300 is worth the price in 2019. What makes the 5300 different than other comparable blenders? And what your options are. Why you may want to consider a refurbished model if you're low on cash. After comparing the Vitamix 5300 to many other options out there, I determined that it’s a fantastic choice IF you want a simple Vitamix that can get the job done. But you should consider the reconditioned model if you need to save a few bucks. I would also look at the Explorian E310 if you’re a single person. The smaller jar included on this model is far more ideal for single batches. If you want the latest in technology and a slightly longer warranty, I would go for the Ascent A2300. Doesn't have any of the "newer" Vitamix functions but is everything you need for almost any blending job. One of the best no-frill blender options available on the market right now. Smaller container is perfect for a single person or small apartment. Can still do everything the bigger Vitamix blenders can do. Has a lot of great technology, but it's not all 100% necessary for great blending. Perfect for someone who is into making their home "smarter". Should You Consider a Reconditioned 5300? What Can You Do With the Vitamix 5300? Where to Buy the Vitamix 5300? What's the Price of the Vitamix 5300? Variable speed control knob: This is the knob on the front of the blender that the user turns from left to right to increase power. 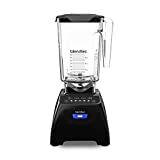 It's arguably the most important feature on any high-quality counter-top blender because it allows you to control how finely you want to pulverize ingredients. Also, by starting slow and increasing over the blend cycle, it's much easier to make the ingredients form a vortex. Pulse switch: Pulsing is a great way to chop ingredients instead of blending to a complete puree. Say you wanted to add some tortilla chips to a hot southwest soup you just made in your Vitamix. Doing a light pulse on the low setting would allow you to keep the chips chunky without fully liquefying them. It's also great for salsas and pesto. Low profile container: The 64 oz low profile container is shorter than the classic container and comes with a wider base. As a result, it also has longer blades (2.8 inches on the classic vs 4 inches on the wide). 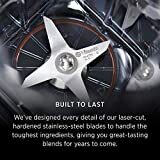 The wide bottom and longer blades make it slightly better at processing larger amounts of ingredients, but less efficient at smaller amounts. It's also an easier fit under cabinets and in small spaces. If you plan on doing really small batches, you can always get a separate smaller container for the C-series blenders (see accessories section). 7-Year Warranty: It's not a "feature" per se, but it's one of the things that makes Vitamix great. I've had very positive interactions with their warranty department over the years. They really stand by their blenders do you can trust you'll have it for a long time. 2.2 HP Motor: To date, these are the most powerful motors that Vitamix uses. All their new home blender lines go up to 2.2 HP. But even if it's lower, it's still more than enough with the tamper to blend anything up in a superb way. It's a C-series blender which gives you some options for some other accessories (namely jars) if you so choose. As I mentioned earlier, it's not a bad idea to invest in a smaller jar at some point if you want to do small batches. I only use a big jar with my Vitamix and tend to just pull out my Nutribullet if I'm doing something small and simple. Red with a black interface. Black with a silver-like interface. Personally, I prefer black because my Vitamix tends to get dirty a lot. Not the fault of the machine of course, I'm just messy in the kitchen. Black is also a bit more neutral and will better match most decor styles. At the time of writing this, the reconditioned 5300 is extremely popular and for good reason. For one, you can tend to find the refurbished units for much cheaper. The only downside is that it comes with a warranty that's 2 years shorter than the standard 7-year. But it's still the same fantastic coverage for 5-years. Reconditioned models also go through a rigorous evaluation process by Vitamix to ensure they're working like new. Finally, it's simply more environmentally friendly. It's a great thing to be able to refurbish something rather than make a new one. Part of the reason that I really like the 5300 is that there's really no blending task that you can't do with it. To name some of the "harder" tasks, you can blend banana ice cream, hot soups, and nut milks. It also makes a great blender for nut butters. And of course, it can tackle the simple tasks with ease. I'm talking things like smoothies, baby food, batters, sauces and salad dressings. Eating more fruits and vegetables will be a breeze. Oh - and let's not forget about chopping. The variable speed dial, long blades and wide container make it excellent at getting a course or fine chop on almost anything. At the time of writing this, the Vitamix 5300 has received an overall positive reception from customers who bought it online. Both the reviews on Vitamix's own site and other popular online retailers are around 80-90% favorable. The few issues I have seen are the refurbished models not working properly or dying out. There are always flaws in any manufacturing or refurbishing process, but it seems rather uncommon. It's certainly annoying if this happens to you and you need to send it back, but I don't think it occurs enough to justify not going with a refurbished blender. It's still guaranteed under warranty. Want more detailed guides about the Vitamix 5300? We've compared it below to a bunch of other products. Be sure to check out those guides as well! Digital Timer: On all the Ascent models including the A2300, there is a digital timer that shows you how long you've been blending for. The Vitamix 5300 has no such thing. It's a useful feature if you want to get super consistent with your recipes. Wireless Smartphone Connectivity: The blenders in the Ascent line all have the ability to connect to a smartphone or tablet. Using the Perfect Blend app, you can access a whole slew of pre-programmed functions for the blender. See video below for more details. Container Options with Smart Detect: The wireless connectivity and Smart Detect go hand in hand. As you use the different containers with Smart Detect Technology, the blender will make adjustments to the program times based on which container is on there. It's a bit confusing at first, but the video below clears it up. Color Options: The A2300 also has a wider range of colors, but I always think black is best! Using your smartphone or tablet with the Ascent blender line. As I say in all my blender reviews, I think all this technology is optional and not a necessity. If you're the type of person that's into making your home and kitchen smarter, then go for it by all means. In fact, if they were priced the same, I would go for the A2300. However, at the end of the day, I strongly feel that the 5300 can get all your blending jobs done without breaking a sweat. I care more about what comes out of the blender and how much I pay for it than the nifty features. But now that you know what the A2300 can do, the final decision is up to you! Pulse Feature: The Professional 200 doesn't have a pulse feature while the 5300 does. Color Options: The Professional 200 only comes in Onyx compared to the Black/Red on the 5300. At this point, I would say that the Professional 200 is a little dated compared to the 5300. It lacks the pulse feature, has less power and doesn't have the low-profile jar. The pulse feature beats switching the Pro 200 on and of when you want to do a really quick chop. Prices being equal I'd pick the 5300 -- I think it's superior. But if I was going to get the Pro 200 for substantially cheaper I might consider it. Aside from the color options (black/red vs onyx/ruby) the Vitamix 5300 and Professional 300 are nearly identical. There's not much to say other than I wouldn't have a preference at all between these two. The final decision pretty much comes down to price and color. Motor Strength: The 5300 has a slightly stronger motor by 0.2-HP. Pre-Programmed Settings: The 500 has 3 walk away blending settings in addition to it's variable speed knob. The 5300 only has the variable speed knob. Jar Style: The 5300 has the low-profile 64-oz jar while the Pro 500 has the classic jar. For me, there's enough pros and cons between these two blenders that it would be a toss up. I don't really care about the 3 pre-programmed settings all that much. As I mentioned, if I wanted the latest in technology, the Ascent series is better. The motor strengths aren't that significant and the jar style is your preference (wider jars are slightly better at big batches while the taller jar does slightly better at small ones). This decision would simply come down to cost for me. I'd get the one that I could find cheaper. 10 speed with +/- buttons and 6 pre-programmed settings. Horsepower: The Total Blender is more powerful than the 5300 with 3-Peak HP compared to 2. You can feel this power when you're using a Blendtec as the motor is extremely strong. Warranty: The Total Blender has an 8-year warranty compared to the 7-year on the 5300. Controls: The 5300 only has a pulse and variable speed dial while the Total Blender can be controlled with the +/- buttons or by using the 6-pre-programmed cycles: batters, ice crush, smoothie, ice Cream, whole juice, hot soup. Tamper: The Total Blender doesn't come with a tamping device while the 5300 does. Jar Size: The Total Blender has a slightly bigger jar than the 5300. Now by the looks of it, it would seem like the Blendtec is the superior model -- and it is in some ways. It just depends on what you're blending. Because of the higher power of the Total Blender, it will sometimes give you the ability to run through ingredients without the need for a tamper. However, there are going to be times when having a tamper comes in real handy. Now -- you can get a Twister Jar for the Total Blender, but it's sold separately. It's Blendtec's tamping device and from the demos I've seen it's quite effective. But at the end of the day, I like the 5300 better as the total package. The motor is powerful enough and with the use of the tamper, there's nothing that can't be blended well. If you have the extra budget for the Twister Jar, though -- then I would get the Total Blender. 5 speed with +/- buttons and 2 pre-programmed settings. Jar Size: The Blendtec 575 has a bigger jar. Horsepower: The Blendtec 575 has a more powerful motor. Tamper: The 5300 comes with a tamping device while the 575 does not. Control style: The Blendtec 575 uses 5 +/- buttons to control the speed with 2 pre-programmed cycles for smoothies and cleaning. Warranty: The 575 has a warranty that's longer by 1-year (8 and 7 years respectively). My opinion on which one to get again comes down to the tamper device. The 575 isn't that much different than the Total Blender aside from the jar and interface. And like I said above -- I prefer to have a tamper. Now - if I was going to get the 575 AND the Blendtec Twister Jar I would pick the 575. I just really hate having to stop blends and to readjust the ingredients to move them closer to the blades. Blendtecs are powerful enough and well-designed to where this won't happen that often or with every type of blend. But when it does happen - I just wish I had that darn tamping device! 8 speed with slider and 5 pre-programmed settings. 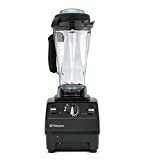 The differences between the Vitamix 5300 and Blendtec 675 are: Jar Size, Horsepower, Tamper, Control Style, Warranty. The Blendtec 675 has a bigger jar, more powerful motor and longer warranty. But like all the other Blendtec's, it doesn't come with a tamper. The 675 also has 8-speed slider and 5 pre-programmed settings (smoothies, frozen treats, whole juice, hot soups, and clean) while the Vitamix 5300 only has the variable speed knob. As I've stated in the previous Blendtec comparisons, I still would want a tamping device. So while I think the 675 is better in a lot of ways compared to the 5300, I would make sure I can afford a Twister Jar (Blendtec's Tamping Device) to go with it. Jar styles: The 5300 only comes with one 64-ounce low profile jar while the Ninja comes with a slew of different things to blend in. I think Ninja wins on this front because it's nice having a smaller vessel to blend in when you're just doing single serve things. It's also nice having a bowl that's specific to food processing. Controls: The Ninja has a bunch of different buttons for different blending applications while the 5300 has the variable speed knob. Tamper: The Ninja doesn't have a tamper, but it's multiple containers and blade styles reduce the need for one. Blades: The Ninja comes with a wide variety of blades for different tasks. The blending blades tend to be a bit sharper, but this isn't necessarily a good thing. You don't need super sharp blades on a blender. Sharp blades are better at chopping while the duller Vitamix blades excel at silky smooth blends through pulverizing. Warranty: The Ninja comes with a 1-year warranty versus the 7-year one on the Vitamix. This is where the Ninja really loses. OK - so I like the idea of the Ninja. The different accessories it comes with makes it super versatile. I've actually gone through a few Ninja blenders myself in the past, but the Vitamix has always been my go-to staple. The main problem is the warranty. If you're going to invest in a blender, you should KNOW that it's going to last you a long time. Granted, you can usually find the Ninja Mega Kitchen System a bit cheaper, but I would personally prefer the 5300. Six additional years of peace of mind is well-worth paying more for. The Vitamix 5300 is available through many online retailers, including the Vitamix website. As of writing this, some other places you may be able to find it are: Amazon, Walmart, Target, Jet and Nordstrom. Since I use Prime, I prefer the Amazon route since the shipping is so quick. Just make sure you're getting a new one. The prices on this blender can change quite often, but I would do my best to try to get a deal that's better than the MSRP. As always, these prices are always fluctuating a bit, but this is what it was at the time of writing this article. If you’re someone who just wants an affordable and reliable blender – then the Vitamix 5300 is a really great choice. Whether you get it reconditioned or new, you can’t really go wrong. I’ve been using a bareboned Vitamix for many years and I’ve never wished that it had anything extra. However, you’re someone who’s into tech then you’ll want to consider the Ascent A2300. The latest technology is really neat and is quite a step beyond that of the previous generation which had the pre-programmed settings on the knob. Finally, if you’re a single person I would consider the Explorian E310. I think you’ll find the 48-ounce jar to be the perfect size.